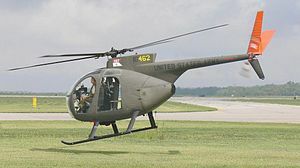 This is a military observation helicopter, OH-6 Cayuse, nickname Loach. I first saw one in Vietnam in 1968. The Loach's original mission was to replace the Army's fixed wing, observation aircraft when the Army was ordered to transfer all fixed wing aircraft to the Air Force. I never had the opportunity to fly in a Loach because my battalion wasn't in the observation business. However, I've seen a lot of them and always knew that if I ever had the chance to crawl in one and go for a ride I would take it. Now, thanks to my buddy, Ryan Schneider, I just came as close to grabbing a ride in one as I'm ever likely to have, and he did it with an email and a link to a YouTube video. I saw this video and thought you'd enjoy it. If the f**k word upsets you - don't even think about watching this with the volume turned on - in fact, you probably shouldn't watch it at all. On the other hand, if you want to see a couple of guys, loving what they are doing, and taking time out to run a bit of a risk to make a kid happy for no reason other than the pure joy of it, you don't want to miss this gem. A couple of other notes before you hit play, if that's what you've decided to do. 1. First, this appears, from the shadow it casts and the sound of the engine, to be a civilian variation of the OH6, which is why I opened this post with discussion of the OH-6. 2. Second, the man on the left is teaching the man on the right to fly. Notice that not once in the course of the mission does his cigarette leave his hand or his mouth. 3. Third, what they did is more than a little risky, but that didn't cross their minds. Thanks again, Ryan. You made my day.